Now that you've accessed some introductory information on needs assessment, it's time to gather tools and other resources. 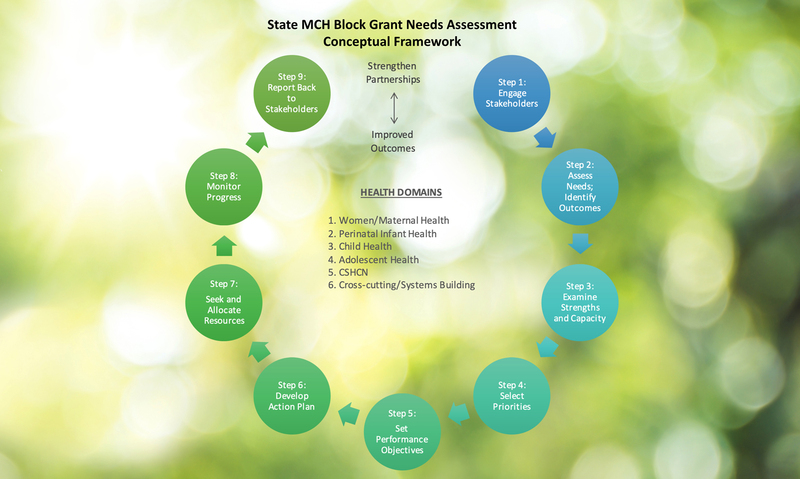 The needs assessment process includes the collection and examination of information about the state's capacity and infrastructure, needs, and desired outcomes for the MCH population, and legislative mandates, etc. This information is used to determine priority goals, develop a plan of action, and allocate funds and resources. The needs assessment is a collaborative process that should include the HRSA/MCHB, the state Department of Health, families, practitioners, the community, and other agencies and organizations within each state and jurisdiction that have an interest in the wellbeing of the MCH population. Title V of the Social Security Act requires states to conduct a statewide Needs Assessment every five years with the primary goal of improving MCH outcomes and strengthening state, local and community partnerships. The following conceptual framework illustrates the continuity of the Needs Assessment process and its relationship to the planning and monitoring functions of Title V and the population that is serves. Essential to the needs assessment process is to engage stakeholders early on and throughout the process.1 States need strong partnerships and effective coalitions to assist in all remaining eight steps of the process. It is expected that states will have ongoing communication with stakeholders and partners throughout the needs assessment process and continue to engage with such partners during interim reporting years. Webinar on Stakeholder Engagement. Date: 2015. Source: AMCHP. Presenter(s): Caroline Stampfel, MPH, Andrea Grosmoske, MSW, PhD, Jessical Seay, MPH, Ashley Busacker, PhD, Nurit Fischler, MS, Kathryn Broderick. Type: Archived Webinar. Level: Intermediate. Length: 60 minutes. You can Engage Families in Your Needs Assessment! Here’s How! Date: 2015. Source: AMCHP and Family Voices. Type: Archived Webinar. Level: Intermediate. Length: 60 minutes. Maximizing Community Stakeholders' Engagement. Source: CityMatCH. Presenter(s): Tom Wolff, PhD. Type: Narrated Slide Presentation. Level: Introductory. Length: 35 minutes. Hallways to Health Sustainability Planning: Engaging Stakeholders. Developed: 2017. Source: School-Based Health Alliance. Type: Webinar. Level: Introductory. Length: 31 minutes. Getting Started and Engaging Your Stakeholders. Source: CDC. Presenter(s): Leslie A. Fierro, MPH; Carlyn Orians, MA. Type: Webinar. Level: Introductory. Length: 50 minutes. Community Partnerships and Perspectives-Intermediate Level. Source: South Central Public Health Partnership. Presenter(s): Linda Usdin, Ph.D.; Anne Witmer, M.P.H. ; Theodore Quant. Type: Online Course Video. Level: Intermediate. Length: 225 minutes. Network Mapping and Analysis. A tool to identify what partnerships and collaborations exist within the MCH system. This tool helps identify potential gaps and opportunities to engage stakeholders. Cultural Safety in Practice with Children, Families, and Communities. This poster provides an overview of the concept of cultural safety and provides guidance on measuring cultural safety and applying the lens of cultural safety in practice. Youth Engagement Tools. Developed by the State Adolescent Health Resource Center (SAHRC), this resource provides guidance and tools for thinking about how to engage youth in state level program and policy development, including Title V needs assessments. You can also access examples of youth engagement through focus groups, partnerships, and advisory structures. Standards for Systems of Care for Children and Youth with Special Healthcare Needs Presentation. (slides). These stakeholder engagement tools are particularly useful as an example of the process for engagement. More information is available from AMCHP. Appreciative Inquiry. A tool that focuses on how to build on existing strengths and how to engage stakeholders to create change. This tool can also be used in Step 4 (Selecting Priorities) and Step 5 (Setting Performance Objectives). In addition, states are guided to identify needs and desired outcomes for cross-cutting and systems issues. Finally, as part of this step, states will also identify legislative, political, community-driven, financial, and/or other internal and external mandates which may go beyond the findings identified through the needs assessment process but remain priorities for implementation within their respective state. The Nuts and Bolts of Using Data to Assess Needs. Date: 2014. Source: AMCHP. Type: Webinar Slides. Level: Intermediate. Focuses on including stakeholders at every step of the process and includes examples from Alaska, Virginia,and Rhode Island. You can also access the slides here. The Health Assessment Process and Your Community. Developed: 2015. Source: CDC. Type: Webinar. Level: Introductory. Length: 7 minutes. Identifying Community Needs and Assets. Developed: 2017. Source: GenerationOn. Type: Narrated Slide Presentation. Level: Introductory. Length: 36 minutes. The Five Rs. A tool used to break down elements of a complex problem. It consolidates stakeholders’ perspectives on the system supporting MCH. System Support Mapping. A tool used to understand the role, responsibilities, needs, resources, and wishes of individuals navigating or supporting the MCH system. Community Toolbox: Section 1: Developing a Plan for Addressing Local Needs and Resources. Part of a comprehensive process developed Center for Community Health and Development at the University of Kansas to develop a plan for community assessment to guide efforts to better understand community needs and resources. The Modified A3 Tool. A tool designed for quality improvement and managing change. It can help groups frame their work together, uncover perspectives, find root causes, and establish measures of success for the changes they want to make. The third step in the process involves examining the state’s capacity to engage in various activities such as conducting the statewide five-year needs assessment and collecting/reporting performance data based on the five MCH population health domains. Specifically, this step entails describing and assessing the state’s current resources, activities, and services as well as the state’s ability to continue to provide quality services by each of the three MCH service levels: 1) Direct Services; 2) Enabling Services; and 3) Public Health Services and Systems. Data Reporting and Quality Measurement—An Introduction. Developed: 2016. Source: Substance Abuse and Mental Health Services Administration. Presenter(s): Peggy O’Brien, PhD, JD. Type: Webinar. Level: Introductory. Length: 60 minutes. Public Health Pronto-Analytical/Assessment Skills. Developed: 2016. Source: MCH Navigator. Presenter(s): Suzanne Bronheim, PhD. Type: Webinar. Level: Introductory. Length: 6 minutes. Measures and Measurement. Source: The George Washington University, School of Nursing. Type: Video Lecture. Level: Introductory. Length: 8 minutes. Whole System Mapping. A tool used to capture a full picture of current services provided for maternal and child health, including where, by whom, and intensity of service. This tool provides an opportunity for stakeholders to see complementary system components and discuss how the parts (could) work together to address identified needs. Asset Mapping. A tool to help stakeholders examine assets and gaps within the maternal and child health system. Understanding assets will help stakeholders select priorities and act. Network Mapping and Analysis. A tool to identify what partnerships and collaborations exist to support selected priorities. This tool helps identify linkages that need to be created or strengthened to reach our outcome. Capacity Assessment for State Title V (CAST-5). A set of assessment and planning tools for examining organizational capacity to carry out key MCH program functions. CAST-5 and the Title V 5-Year Needs Assessment. This document explains how to use CAST-5 as a modular toolet during and as follow-up to the 5-year needs assessment. CAST-5 Process Indicators Tool to Assess Organization’s Capacity to Perform 10 Essential Public Health Services. Programs can assess performance for all 10 MCH Essential Services or for a subset of the Essential Services that are most relevant to the population health needs identified in the 5-year needs assessment. Capacity Needs Tool. Programs can use this structured method to identify organizational resources needed to implement the MCH Essential Services and achieve desired levels of performance. SWOT Analysis. Programs can use this to assess strengths, weaknesses, opportunities, threats around each essential service. CAST-5 a la Carte Options for using the tool in different ways and pros/cons of each approach. In order to select priorities as step 4 of the needs assessment process, each state must examine the identified needs and match them to the desired outcomes, required mandates and level of existing capacity. States are guided to select seven to ten priority areas for targeted focus in promoting continued improvement and progress. Identifying State Priority Needs. Developed: 2015. Source: AMCHP. Type: Webinar Slides. Level: Intermediate. Includes examples from New Mexico and Kansas and additional resources from Colorado and Louisiana; Discusses stakeholder engagement in determining priorities. You can also access the slides here. Best Practices for Identifying Strategic Priorities. Developed: 2018. Source: SME Strategy. Presenter(s): Anthony Taylor. Type: Video. Level: Introductory. Length: 39 minutes. First Things First: Priority Setting. Developed: 2016. Source: County Health Rankings and Roadmaps. Presenter(s): Jan O’Neill, Kate Konkle. Type: Webinar. Level: Introductory. Length: 19 minutes. Concept Mapping. A tool used to help stakeholders identify areas of consensus and priorities that are important and actionable. Causal Loop Diagramming. A tool used to help stakeholders identify leverage points/priorities to shift the entire structure and not simply treat the “symptom” of the problem. This tool will help your stakeholders understand the forces shaping the problem, uncover assumptions about the problem, identify unintended consequences, and identify strategies to influence the system. Prioritization Matrix. The last phase of the CAST-5 Process highlights selecting priorities. This document provides an overview and tool for Prioritizing Needs. Impact Matrix. A tool to help groups identify and achieve agreement on activities that can be implemented with maximum impact given the effort invested. This is an easy-to-facilitate tool that can be used when a team (or a group of stakeholders) has many ideas about potential courses of action and wants to consider the impact of all potential solutions before deciding on a course of action. In step 5, setting performance objectives consists of two phases. In the first phase, each state will develop action strategies to address their identified priority needs. States will select five National Performance Measures (NPMs), Evidence-based or -informed Strategy Measures (ESMs) for each of the selected NPMs, and State Performance Measures (SPMs). Secondly, the state will set five-year targets (i.e., performance objectives) for the five selected NPMs, the ESMs and the SPMs. The anticipated results of this stage are the identification of NOMs, NPMs, ESMs and SPMs that directly relate to the state priorities and establish a level of accountability for achieving measurable progress. Performance Measurement and Title V Transformation: Building Skills to Select and Design Measures for MCH 3.0. Developed: 2015. Source: AMCHP. Presenter(s): Donna Petersen, ScD, MHS; Michael Kogan, PhD. Type: Video Conference. Level: Intermediate. Length: 130 minutes. Performance and Outcome Measurement: Strategies for Target-Setting. Developed: 2012. Source: AMCHP. Presenter(s): Deborah Rosenberg, PhD. Type: Presentation Slides (Skills session at the AMCHP Annual Conference). ESM Review & Resources: National Summary. This report serves as a conversation starter as we learn how to strengthen our strategies, work with the Evidence Center, and look toward the next iteration of block grant applications and work. Results Based Accountability (RBA) Tip Sheet. Check out this quick "cheat sheet" to learn about how RBA relates to ESMs and for tips on writing effective measures. Logic Models. Logic Models are simplified graphic depictions of a program, initiative, or strategy. They provide a map of the relationships between the resources, activities, and benefits or changes that result. Logic Models demonstrate the theory of change, and can be useful in program planning, management, communicating with partners, and needs assessment. The next step is to develop an action plan, which involves the planning and identification of specific activities to implement the program strategies developed in step 5. Part of this process is to create the Five-year State Action Plan Table, which at a minimum includes relevant priority needs, key strategies and measures for each of the MCH health domains. Consider current research and evidence-based practices to select and customize activities aimed at accomplishing performance measures. It may also be helpful to obtain technical assistance from the Strengthen the Evidence project for information on current research reports and activities that have been successfully implemented in other states and jurisdictions. An Introduction to Selecting Interventions and Developing Action Plans. Developed: 2014. Source: UCSF Family Health Outcomes Project. Presenter(s): Jennifer Rienks, PhD; Ruth Long, MA, MPH.Type: Webinar. Level: Introductory. Length: 47 minutes. Developing an Action Plan. Developed: 2015. Source: Lake Superior Quality Innovation Network. Presenter(s): Kathleen Lavich.Type: Webinar. Level: Introductory. Length: 20 minutes. Plan-Do-Study-Act Cycle. A tool used to help stakeholders test strategies and innovations on a small scale in order to learn how to adapt the strategy to fit with the environment in which it is being implemented. The tool provides a structured way to plan how the test will be carried out, try it, observe and collect data, and adapt the strategy based on what is learned. 30/30 Action Plan: PDF | Word document (editable). A simple way to monitor progress and record future action steps in ongoing work. The idea is that the team meets for 30 minutes every 30 days to discuss progress over the past month. The progress, roadblocks and other relevant ideas are noted on the form, along with an action plan for the following month. Causal Loop Diagramming. A tool used to help stakeholders identify leverage points/priorities to shift the entire structure and not simply treat the “symptom” of the problem. This tool will help your stakeholders understand the forces shaping the problem, uncover assumptions about the problem, identify unintended consequences, and identify strategies to influence the system. Use Causal Loop Diagramming as a way to identify activities and develop an Action plan. Simulation. A tool used to predict outcomes based on formulas and selected variables and interventions. This tool allows stakeholders “test” interventions in a virtual arena and understand the impacts of selected interventions. Following the identification of program activities in step 6, is the allocation of resources. In step 7, the focus is on the funding of planned activities to address state priorities. Inputs include the five-year State Action Plan, current budgets, political priorities, and partnerships. The anticipated outcome is the development of a program budget and plan that directs available resources towards the activities identified in step 6 as the most important for addressing the state's priorities. Public Health Pronto-Financial Planning and Management Skills. Developed: 2016. Source: MCH Navigator. Presenter(s): Jennifer McKeever, MSW. Type: Video Podcast. Level: Introductory. Length: 5 minutes. In step 8, states examine the results of their efforts to gauge whether there has been improvement or change. Inputs include NOMs, NPMs, SPMs and ESMs, performance objectives and other quantitative and qualitative information. Potential outcomes may include altering activities and shifting resource allocations to address current levels of performance and availability of resources. Feedback loops between various stages of the process allow for continuous input and re-evaluation of the outputs. Evaluate Need and Impact-Understanding the Importance of Monitoring and Evaluation. Developed: 2014. Source: Healthy Start EPIC Center. Presenter(s): Sharon Corle, Jeffrey Guidry, PhD. Type: Video Lecture. Level: Introductory. Length: 36 minutes. Measurement Tables. A Measurement table documents your plan to monitor progress toward goals over time. If you have already completed logic models for each domain, a Measurement Table can be used to further flesh out ideas for measuring each activity described in the logic model. This final step ensures accountability to the stakeholders and partners who have worked with the MCH staff throughout the needs assessment process. It also assures the continued involvement of all stakeholders and partners in the ongoing needs assessment processes. Writing Reports and Sharing Assessment Results. Gathering Data, Developing Conclusions, and Putting your Findings to Use. Date Developed: Unknown. Source: CDC. Presenter(s): Christina Christie. Type: Webinar. Level: Introductory. Length: 65 minutes. How to Tell Your Program’s Story to Key Stakeholders. Date Developed: October 9, 2018. Source: Association of University Centers on Disabilities, Interdisciplinary Technical Assistance Center on Autism and Developmental Disabilities. Presenter(s): Deborah Klein Walker, PhD. Type: Video Meeting. Level: Introductory. Length: 48 minutes. Data Placemats. Data placemats help stakeholders interpret and draw meaning from data. They can be particularly effective in communicating the current health status of sub-groups, and can be easily customized for sharing data with various audiences.